This curry rice is one of my comfort foods, I fell in love the first time I had it in Japan years back. 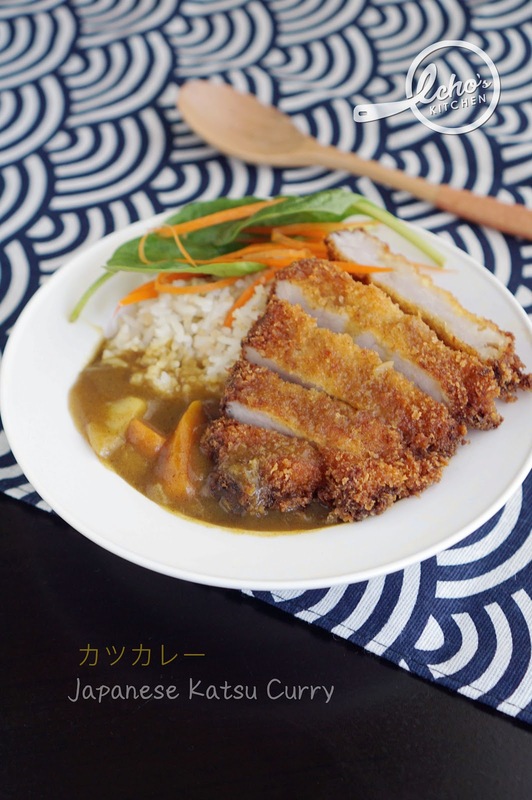 I also often order this dish whenever I visit Japanese restaurant here in US, or when I work in NYC, some of the Japanese Deli/Restaurants sell very good Katsu Curry Bento. I bought a box of very good Kagoshima Kurobuta (かごしま黒豚, "Kagoshima black pig") chop from Japanese Supermarket few days back. 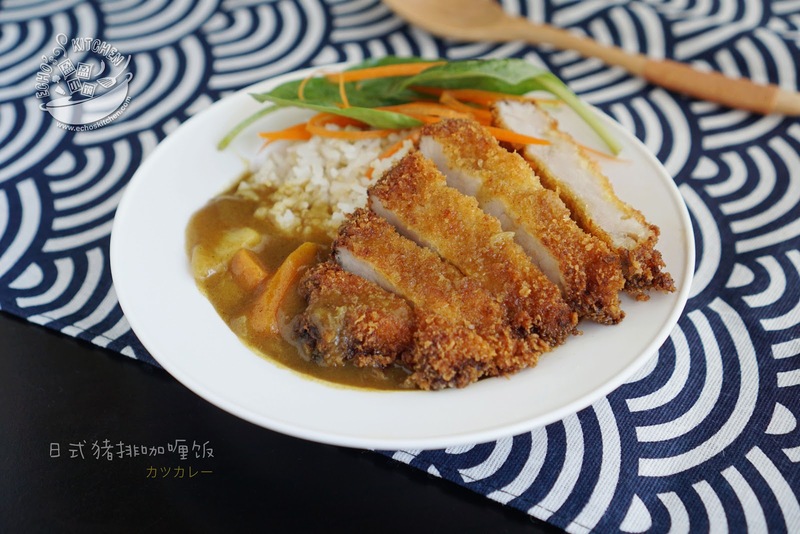 Since it is long weekends here, I made my favorite Katsu Curry and rice and had one of the best home cook meals in months! 1. Soaked pork chops submerged in a pot of cold water with a pinch of baking soda for 10 minutes. This is to reduce the "porky" smell of pork chops. 2. Pat dry using kitchen towel, place the pork chop into a clean plastic bag and give it a good pounding using a mallet to tenderize it. You can also get help from a ever so energetic toddler! 3. Give the side of meat, which the white part of stringy meat a few cuts to prevent curling of pork chop during the cooking process. 4. Marinate the pork chops with ONLY Shio-Koji for at least 6 hours, I did mine overnight. 5. Place flour, egg and panko in three different plates. 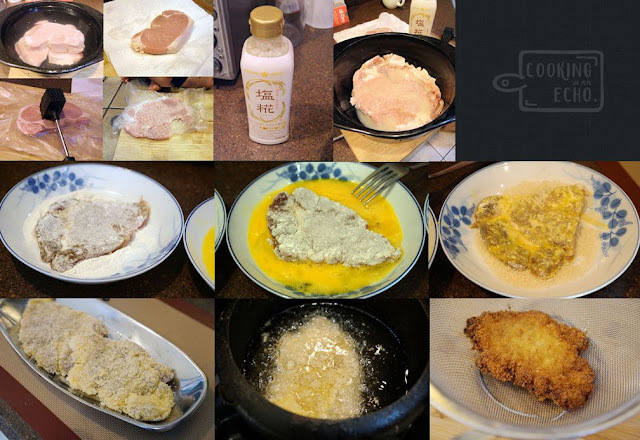 Dredge pork chop with flour, then dip into egg and finally coat the entirely pork chop with panko, press to ensure even coating. Repeat these steps for remaining pork chops. 6. Let the pork chop sit for 5-8 minutes. Heat up 2 inches of oil in a fryer. 7. Deep fry the pork chop, one at a time until golden and crispy. Let the fried Katsu rest for few minute, slice and plate with curry and rice. 8. Slice/cut vegetables accordingly. Heat 1 tbsp of oil in a pot at medium and add the garlic and onion. Saute the onion and garlic until the onion translucent and garlic slightly browned. 9. 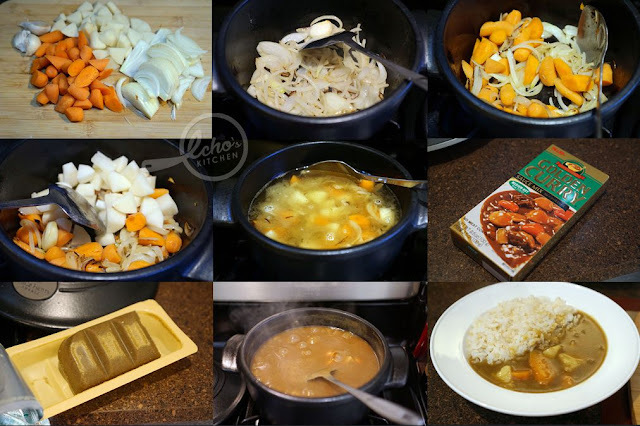 Add the carrots and cook for 1-2 minutes, add potato cubes and enough water to submerge all ingredients, about 2/3 of the pot. Bring to boil and add the curry cubes. Keep stirring to make sure the curry cubes are not sticking to the bottom of the pot. 10. Turn the heat to medium low and cook for around 25-30 minutes until carrots and potatoes are tender. Season with soy sauce and serve over rice with Pork Cutlet.